US President Donald Trump’s visit to Saudi Arabia offered a rare glimpse into his emerging foreign-policy agenda. It is now all but certain that the Trump administration will abstain from lecturing foreign leaders about their countries’ democratic shortcomings, and that promoting human rights will take a backseat to other priorities. Efforts to encourage democracy and respect for human rights have rarely, if ever, prevailed against $110 billion arms sales, and this will be especially true during Trump’s presidency. Whether a potential business partner adheres to international human-rights norms seems to be irrelevant to this administration. But the real news from Trump’s trip is that he has now fully embraced the Sunni Arab world, not least for its opposition to Iran. In his speech at a gathering of Sunni Muslim leaders in Riyadh, Trump delivered a sharp and visceral rebuke of all things Iranian—including, it seems, that country’s recent elections. His remarks were music to the ears of Sunni Arab leaders, who regard Iran as the root of all evil, and the source of the Shia resurgence in Iraq. In Israel, Trump continued to warn of an Iranian menace, and he revealed why Iran is so central to his thinking. Trump believes that Israel and Sunni Arab countries are actually allies in a mortal struggle with Iran, and that they should unite around that cause, rather than allow such issues as the Palestinian territories to keep them apart. Trump seems to think that this one supposed insight into the Israeli-Palestinian conflict can be parlayed into a settlement that finally achieves peace in the Middle East—or at least realigns the region to confront Iran. 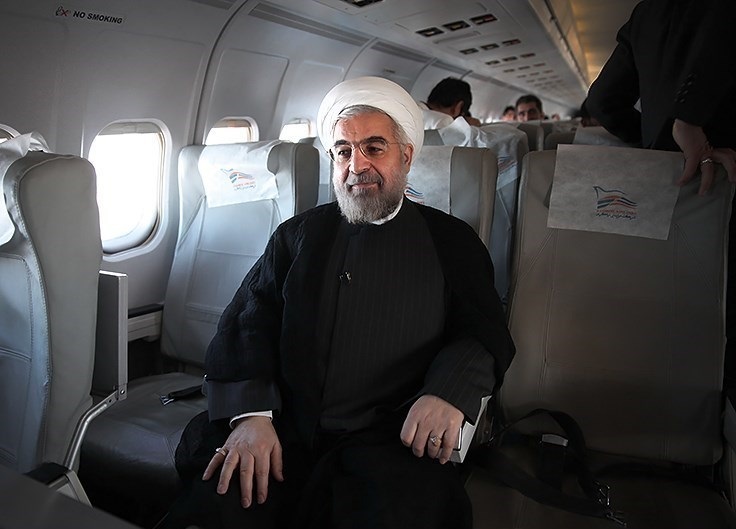 While Trump was en route to Saudi Arabia, Iranian voters elected their moderate incumbent president, Hassan Rouhani, to a second term, and gave him a mandate to introduce urgently needed reforms. To be sure, Iran’s electoral process is often questioned, and for good reason. The Guardian Council, an unelected body of Islamic jurists, vets every candidate; and the Revolutionary Guard oversees all elections. Still, the spirited campaign between Rouhani and his main opponent, Ebrahim Raisi, suggests that this election was not a sham. In Rouhani and Raisi, Iranian voters faced a stark choice. Raisi has a well-deserved reputation as a hardline cleric and former prosecutor with anti-Western views. Had he been elected, the future of the Iranian nuclear deal with the P5+1 (the five permanent members of the United Nations Security Council, plus Germany) might have been called into question. The high voter turnout in the election—more than 75%—suggests that Iranians do not want to turn away from the deal. While most households have not benefited from the slow lifting of international sanctions, and unemployment remains high, they remain willing to trust Rouhani to deliver on his promise to improve ordinary Iranians’ livelihoods. But it will be up to Iranians themselves to push for the reforms they need. It is clear that neither the Sunni Arab world nor the current US government is betting on—or even rooting for—Rouhani’s success. In recent history, the US-Iran relationship has been particularly fraught. In 1979, after an uprising against Shah Mohammad Reza Pahlavi and his dreaded SAVAK secret police, Iranian mobs seized the American embassy. They accused American diplomats of espionage, and held them for 444 days. After a long, delicate negotiating process, the hostages were finally set free, on the day of President Ronald Reagan’s inauguration. Since then, Iran has never apologised for the hostage episode; and the United States has never forgiven Iran. When the US invaded Iraq in 2003, many observers, especially in the Arab world, believed that the removal of Saddam Hussein’s Sunni-minority regime would enhance Iran’s position in the region. In the aftermath of the invasion, Shia Iraqi militias, which Iran had financed and armed with sophisticated explosive devices, regularly attacked US troops. These militias were aided by the Quds Force, the Revolutionary Guard’s special forces unit, which took its direction from Iran’s religious leadership. Iran never acknowledged its complicity in the attacks on US forces in Iraq. Not surprisingly, many senior US military leaders’ views toward Iran have been influenced by that brutal period. That is certainly true of Secretary of Defense James Mattis, a retired Marine Corps general. Making matters worse, Mahmoud Ahmadinejad, Iran’s president from 2005 to 2013, not only challenged Israel’s right to exist—a position to which Sunni Arab leaders had long paid lip service; he also declared the Holocaust a hoax, pushing his country even further into international isolation. More recently, Iran has continued to prop up Syrian President Bashar al-Assad, and it has maintained its longstanding support for Hezbollah, the Lebanese Shia militia. As the Trump administration has debated its approach to Iran, it has had to come to grips with the fact that the nuclear deal cannot easily be changed. Still, while Trump was in the Middle East, the US Congress began considering a new round of sanctions to punish Iran for its continued meddling in Syria, and for its support for groups deemed to be terrorist, such as Hezbollah. Iran’s bitter internal politics suggest that it may be on the brink of change. But the country’s dark legacy, from the hostage crisis in 1979 to its involvement in Syria today, is not one that many US policymakers will readily forgive or forget. In the end, it is up to Iranians to decide their future. They have taken an important first step by re-electing Rouhani, and they will now have to support him as he pursues difficult domestic and foreign-policy reforms. Iran has much to make up for in its relations with the rest of the world. But if reforms can be implemented and sustained, and if the nuclear deal can be protected from hardliners, Iran will be able to break free of its past and become a normal member of the international community. Christopher R. Hill, former US Assistant Secretary of State for East Asia, is Dean of the Korbel School of International Studies, University of Denver, and the author of Outpost. Image courtesy of Wikipedia.